One of nature’s greatest spectacles known in the arribadas category; Though they are the most abundant of sea turtles, olive ridleys are increasingly threatened by trawling and coastal development. The second smallest after the Kemp’s ridley, the olive ridley turtles weigh between 75-100 pounds and reach 2-2 ½ feet in length. They are named for their pale green carapace or shell and are the most abundant of sea turtle species. Male olive ridleys can be distinguished from females by their tails, which stick out beyond their carapace. Diet: omnivorous turtle which feeds on crustaceans, mollusks and tunicates. Olive ridleys occur worldwide, and are found mainly in tropical regions of the: Pacific, Indian, and Southern Atlantic Oceans. They are primarily pelagic, spending much of their life in the open ocean, but may also inhabit continental shelf areas, and venture into bays and estuaries. The Olive ridley inhabits tropical and subtropical coastal bays, or estuaries. These animals are found in the Pacific and Indian Oceans, and along the Atlantic coast of West Africa and the Atlantic coast of South America. Olive ridley sea turtles eat crabs, shrimp, rock lobsters, and jellyfish. These make up their main diet with food found in the western Atlantic, and eastern Pacific Oceans. There are data indicating that olive ridleys in other parts of the world eat mainly algae. These turtles are migratory, sometimes traveling several thousand miles between feeding grounds, and nesting sites. They are excellent divers spending a great deal of time underwater hunting for food. Trawlers on the east coast of Australia reported that most turtles caught in their nets were taken at depths up to 36 to 131 ft. It is believed that foraging depths of over 328 ft. are not uncommon. Olive ridleys come ashore simultaneously by the hundreds and thousands to nest. Olive ridley turtles use three different strategies to nest: arribadas, solitary nests, and mixed strategy. An arribada is a mass-nesting event when thousands of turtles come ashore at the same time to lay eggs on the same shore. Like the Kemp’s ridley, nest in masses referred to as arribadas. During arribadas, thousands of females may nest over the course of a few days to a few weeks. Adults reach sexual maturity around the age of fifteen years. Nesting primarily takes place at night during high tide period. The female leaves the water, and painstakingly crawls to a place of her liking above the high tide mark; where she digs a nesting hole with her hind flippers. She deposits around 50 to 200 eggs. Along with Kemp’s ridleys, olive ridleys are the only sea turtles species to exhibit synchronous mass nesting, termed arribadas. During the arribadas, the Spanish word for ‘arrivals,’ tens of thousands of female turtles nest during the same seven day period, once a month. Kemp’s ridleys along with Flatbacks, and Olive ridleys are, the only sea turtle species to commonly nest during the day. Although not definitely known, the age of sexual maturity, is estimated to be seven to fifteen years of age, or when they reach a carapace length of about 23.6 in. No one knows exactly how often the females lay eggs but most scientist believes that they spawn every two to three years. 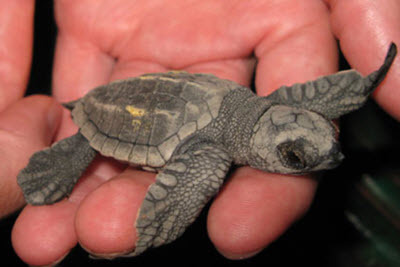 The Olive ridley turtle was listed under the ESA on, July 28, 1978. The breeding populations in the Pacific coast of Mexico are listed as endangered; elsewhere the species is listed as threatened. Their primary threats are coastal development, consumption of their eggs, and entanglement in fishing gear. The olive ridley’s life is fraught with many dangers. It is estimated that only one of a thousand hatchlings reaches maturity. The mortality rate in newly hatched and juveniles is extremely high. Predators such as small, carnivorous land animals, birds, and sharks and other fishes, add to a serious reduction in turtle population. As is so often the case of animal safety, man is the worst offender when it comes to loss of animal life. The olive ridley’s sea turtle is protected in almost all countries but monitoring of the law is lax in many countries and many turtles are harvested every year for their meat. Eggs are also harvested as food. Although the ridley is legally protected in most areas where it occurs, frequently little, or no enforcement of laws and regulations takes place. expeditions: in United States, and Mexico waters. Continued direct and incidental fishing expeditions, particularly using shrimp trawl nets, remains a serious concern in the western Atlantic and Indian Oceans.